TDmonthly® - New Toys and Games: Rody Horse - Green from TMI TOYMARKETING INTERNATIONAL INC.
From: TMI TOYMARKETING INTERNATIONAL INC. 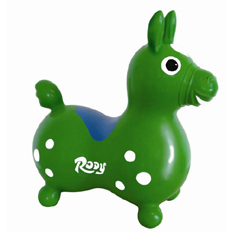 Ideal for learning balance and coordination, the Rody Horse allows children to hop around and can even be attached to a base that transforms it into a Rocking Rody Horse. The soft ride-on is often used in therapy for handicapped children, and is made of super-strong, latex-free vinyl. It inflates according to the size and weight of a child with a hand or foot pump. The maximum inflated height to “saddle” is 12". — “Rodys have always sold well for us. Over and over, people tell us they were the hit of the party,” Elaine Hackney, owner of Boing! JP’s Toy Shop in Jamaica Plain, Mass., told TDmonthly in summer 2007. — Nobody can resist a bounce or two on this high-quality rubber toy from Italy. 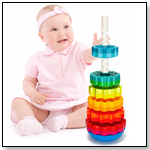 Rody comes in assorted colors and has been a steady seller in specialty stores for more than a decade. The combination of high quality, great play value and universal appeal earned this toy a TDmonthly Classic Toy 2007 award. — “We sell a ton of Rodys by TMI. This is one of the best sellers in the store,” Peg Scholtes, owner of Capitol Kids Ltd. in Madison, Wis., told TDmonthly in March 2008.